This entry was posted in Metabolic Medical Center Recipes, Modified Profast (Fast and Flexible) Recipes, Nutriplus Recipes (Balance Your Pyramid), Party & Entertaining, Uncategorized, Vegetables and tagged Black pepper, garlic, grill, okra, olive oil, side dish, snack, Vegetable, vegetarian by foodies4mmc. Bookmark the permalink. I have tried this, and I really liked it. I like okra, and this is a new way for me to enjoy it! Absolutely Delicious!! I’ve used both frozen and fresh, and both were fabulous! No slime!! This looks great. Did you wash it then dry with paper towel or let it air dry? We washed the okra and let it air dry. 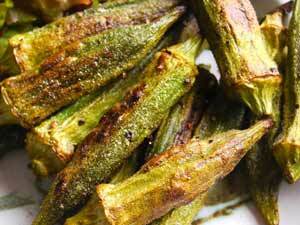 I suppose you could pat the okra dry, it is hard to rub dry because of the texture. Enjoy. So good! This was my first time making okra, so I added 1/2 tsp of lemon juice because I was so worried about the slime. This came out perfectly and was gone in one sitting. Thanks!